Every autumn we’re greeted with cooler air and a dazzling array of colors twinkling from the trees and falling to the ground. Did you know that the range of leaf colors we see in the fall is greatly influenced by the weather and environment? Leaves need sunlight, air, water and chlorophyll to make food (sugar) for the tree. As the leaves get less light each day in the fall and stop making food to prepare for the winter, the chlorophyll (green color in the leaves) fade and other colors – mainly red, yellow, orange and tan – in the leaves begin to show. Without food, the stems of the leaves will weaken and the leaves will then fall from the tree. Similarly, as the seasons change over the years, our hormones are heavily influenced by the environment, our diet and lifestyle. While we don’t change colors due to lack of chlorophyll, our bodies do begin to struggle with hormone imbalances as we age. Our daily environment is more toxic than ever before – in the air we breathe, the water we drink, the food we eat and the products we use. Additionally, we often find ourselves in stressful environments, like work. When you’re stressed, cortisol is released into the body. However, elevated cortisol over the long term consistently produces glucose, leading to increased blood sugar levels which can cause weight gain, fatigue and other downright miserable symptoms. Cortisol also rapidly depletes many nutrients required for good hormone function and energy production like Vitamin B, Vitamin C and magnesium. The food we eat can either nourish our hormones or disrupt and stress them. While our hormones need a steady stream of nutrients to work efficiently, many of us are consuming the wrong foods that aren’t supplying our hormones with what they need. It is vital that our bodies receive adequate proteins to produce and transport hormones, vitamins and minerals to help them metabolize and break down, good fats to help them work, antioxidants and phytonutrients to protect them, good carbohydrates, fiber and clean water to help them move about and detoxify. In cahoots with our daily environment and our diet, our lifestyle can weigh heavily on our hormone imbalances. Exercise is a no-brainer for hormone health! It’s important to incorporate at least 30 minutes of exercise a few times a week into your lifestyle. Without activity, our muscles fade away, our circulation declines and becomes stagnate and our fat stores up – which puts us at a much higher risk of serious disease. Likewise, sleep is essential to maintain proper hormone balance and health. Hormone imbalances often contribute to disturbed sleep patterns and can lead to sleepless nights. It is absolutely necessary to get a good night’s rest so that your body can repair and rejuvenate. Hormones have no chance to do their healing work without sleep. When you lose sleep, you can’t just catch up the next night since your hormones don’t just spring back into action like so. Sleeping less than you need can affect various hormones causing them to alter and disrupt appetite, fertility, mental health and cardiac health. Hormones affect our brain, heart, bones, muscles and reproductive organs. They work best when they are balanced, but fluctuations are a natural part of life as we age. Regulating hormone imbalances is key to ensuring your body stays healthy long into old age. 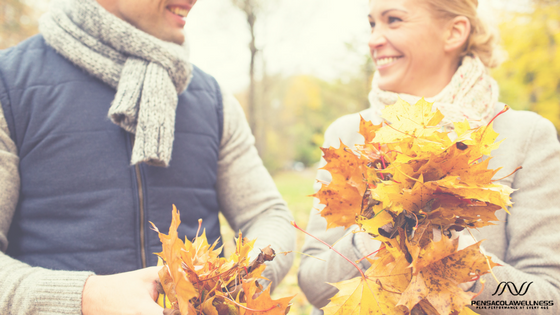 If you’re struggling with hormone imbalances, scheduling a consultation with a hormone expert should be first on your list– even before you bring out your fall decorations and enjoy your pumpkin-spiced favorites! As the leaves begin to change, let that be a reminder that your body, and your hormones, is also changing! At Pensacola Wellness Solutions, we specialize in accurately addressing hormone imbalance symptoms by creating custom tailored hormone treatment plans specific to your needs! Schedule your appointment with Dr. Mitchell today by calling (850) 791-6010 or visiting our Patient Portal today!